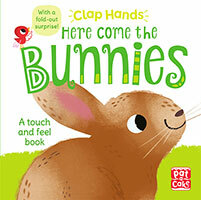 Toddlers will love this interactive touch-and-feel book of cute bunny friends.Toddlers will love this interactive touch-and-feel book of cute bunny friends. Here Come the Bunnies is a playful touch-and-feel book, full of energy, fun and of course, lots of cute bunny friends! Toddlers will laugh, shout, clap their hands and join in the fun as the simple text encourages them to point, count, match and talk about the friendly, fluffy pals playing on every page. With textures to feel on every page and a big, fold-out surprise at the end, everyone will want to clap hands for the bunnies!